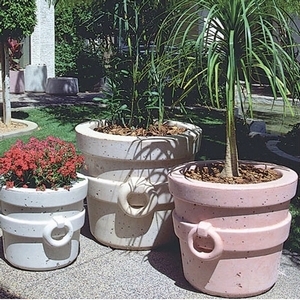 Concrete Pots & Planters | Lots of sizes, Durable, Ships across the US. This tall garden planter is unique with a large ring dangling off the front. There are two large flat rings bordering the top opening and middle of the planter. This gives the Tucson design it's original look. Tall enough to hold all plant materials regardless of root system this planter is durable, decorative and functional.